Manufacturers shipped 216.2 million smartphones worldwide in Q1, 2013, compared with 189 million regular cellphones, according to IDC. 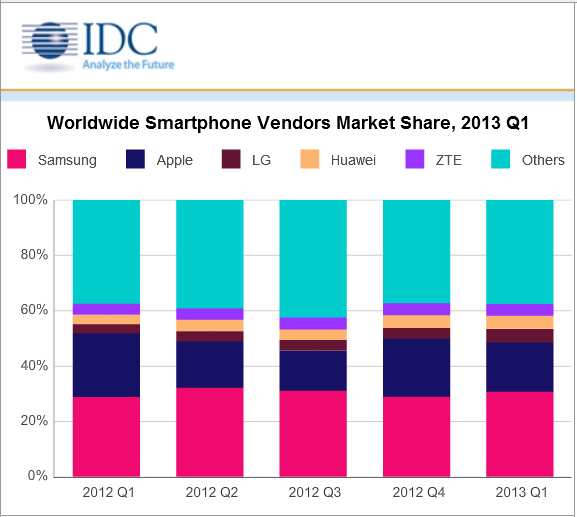 IDC Q1, 2013 numbers compare facorably to 402.4 million units in the Q1,2012 (YoY) and down from 483.2 million units in the Q4, 2012.Smartphones thus made up 51.6 percent of the 418.6 million mobile phones shipped. The shift to a global majority of smartphones is now being driven by consumers in developing countries such as China, India and Indonesia. Samsung retains the smartphone crown taking 32.7% of the market shipping out 70.7 million smartphones – thus becoming the defacto Android standard. Samsung’s up 61% over a year earlier.Apple slipped in its numbers to close Q1, 2013 at 17.3% of the smartphone market share with 37.4 mln units. Apple’s market share market share fell to 17% from 23% a year earlier. Samsung’s dominance of the smartphone markets is so superior that it ships more smartphones than its next 4 competitors put together. Total Mobile phone shipments increased 4% YoY driven solely by 41% increase in smartphones compensating 19% drop in dumbphones. This is third and concluding part of a series of posts that discuss the Rise and Fall of Educomp track the growth of the prodigal education services company and track the factors that led to its fall. Read Part I and Part II here. A Capex intensive balance sheet and a diffused sense of direction aside, it was Educomp’s financial wizardry and creative accounting that puts the spotlight on Educomp taking what is clearly a unsustainable basis for business. Educomp formed Edusmart, an ‘unrelated’ company headed by one of Educomp’s senior executives. The new company took over all of Educomp’s newer five-year school contracts, pledged the receivables with banks in return for roughly 75 percent of the amount as a lump sum, most of which it meekly handed over to Educomp. This innovative technique even ended up making its debt disappear for a while. Educomp itself was the guarantor of the bank loans to Edusmart. The model’s sole purpose seemed to allow Educomp to book three-fourths of a school’s five-year annuity revenue right upfront, thus inflating revenue and profits. Clearly, the move was amied at keeping the securitised debt off Educomp’s books as contingent liability, otherwise the higher leverage ratio would have meant banks wouldn’t lend money for their K-12 schools business. This is why Educomp’s total debt as of March 2012 is just Rs 337 crore, while its total liabilities were Rs 2,148 crore. When Educomp saw growth slowing down because they’d penetrated most premium ICSE and CBSE schools, a better way would have been to educate the market and make itself more sustainable instead of changing their accounting model by using a private company to book revenue upfront. And just when, you would think the list of follies was closing, Educomp stepped into even more capital-intensive setup by deciding to buy the land on which to put up its schools instead of long-term leases like most competitors. Schools are valued on the basis of their cash flows, not land banks. Because whatever the land’s real value, on the school’s books it can only be notional because it can’t ever be de-linked and sold. Today, the 47 schools run by Educomp have nearly 50,000 seats between them, filled with only 22,000 students. In India any educational services company should be a private and not public listed business. While listing might bring capital, it will inevitably also force businesses to take unsustainable steps to drive higher growth and valuation. In Educomp’s case it was a combination of poor execution, lack of adequate planning and oversight, and overreach as its businesses grew at a faster pace than its management capability. Lately and Belatedly Educomp seems to have realized its mistakes. Post a $155 million infusion by International Finance Corporation, Proparco and Mount Kellett – Educomp seems to be focusing on a transformation plan that seeks to focus the company’s attention on two primary businesses: The content-based Smart Class and the asset-backed K-12 schools. Most other businesses will be sold off progressively. Since July last year Educomp has sold off its stake in Eurokids, a pre-school chain and raised Rs 22 crore for its online learning subsidiary authorGen in a funding round led by private equity firm Kaizen. Pearson is likely to acquire its entire stake in the loss making IndiaCan venture imminently. Also up for sale are Educomp’s majority stake in coaching firm Vidyamandir Classes and test preparation company Gateforum. But would that be enough? I guess not. Educomp will find it difficult to bounce back to its former glory – the market today is more crowded and perhaps more specialized. Educomp will be one of the bigger players (perhaps the biggest), but the markets would have split into fragments – all of which Educomp will not recover. Apple – the formidable under Steve Jobs has fallen fast from the cutting edge technology leadership under pincer attack from the likes of Google (Car, Glass?) and Samsung (Eye Scroll, Mind Control?). The features listed here are top of mind recalls – and a careful think could provide any and many others. For the sake of the most exciting company of our times, I hope that Tim Cook has what it takes to turn it around. So while Apple has been missing in action on the “Glass” kind of immersive augmented reality application – there’s some buzz and heat on the Apple iWatch. Now then, Apple already has a device which is iPod Nano watch thereby bringing Music, e-mail, iTunes, podcasts, pedometer on the wrists. 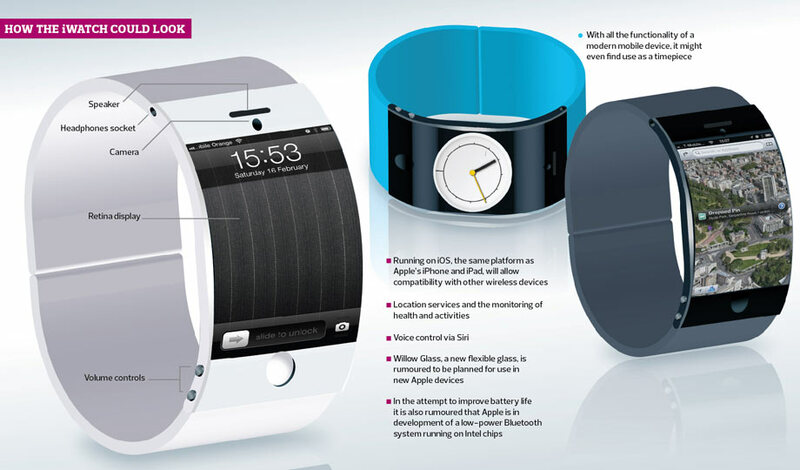 So Apple’s foray into this space has a predecessor which was cool thingie on the wrist. 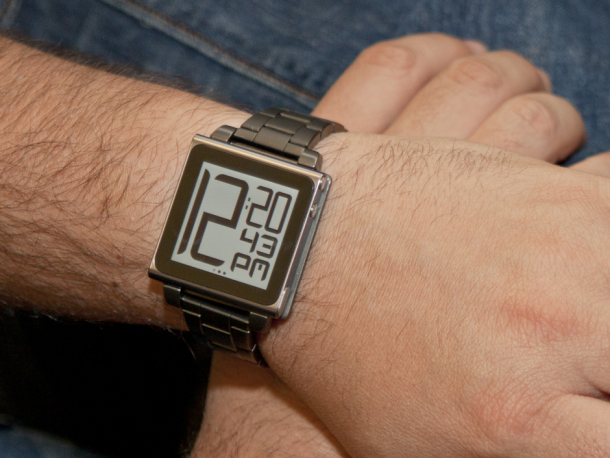 However, dismissing the iWatch as a watch with features is a mistake. Apple would be inclined to see this as its first foray into wearable technologies – combining the device and apps with physical activity sensors, pulse monitor, blood pressure and possibly glucose monitor. Unlike other wearable technologies like, say, headphones, these devices allow you to monitor and analyze sleep, health, and fitness levels. In short, physical states and well being. The ancient Greeks often made a distinction between two notions of time, Chronos and Kairos. Chronos is chronological time which flows ineluctably along by seconds, hours and years, unaffected by human interests. Kairos, etymological root of “care,” is time laden with human meaning and activity. “Lunchtime,” “a good night’s sleep,” and a “long and rejuvenating walk,” all convey this sense of Kairos. A Timex is mainly chronological. What Apple could be doing is making a “kairologocial” tool that tracks and monitors the data around the experiences you care about. How much you actually slept, when and how far you walked. Basic questions rooted from everyday experience might now be by settled by data on a “watch” — a “kairometer” — rather than guesswork. Transforming the user’s experience by making impersonal things more personal and intimate has long been at the core of Apple product’s value proposition. For example, Steve Jobs positioned the iPad as a way for customers to “connect with their…content in a more intimate…way than ever before.” The Apple watch would likely build on this logic, aiming to make users’ experience of time more intimate by tying it to who they are and what they care about. That way the Apple iWatch would want too scale its effectiveness over something like the Nike Fuel Band by adding states of well being and not just fitness. Afterall, Lifestyle (iWatch posssibly!) is much bigger than just fitness (Nike Fuel Band). 2. And then there is the space where you connect the dots. Apps for health/lifestyle; an Interface that really goes past platforms – Phone, TV, Media and more; and a presence which is passive over long long periods of time. You wear a wrist watch for atleast 8-14 hrs of your day! And that’s a lot of data collected. 3. Apple experience has mastered the external environment – the iWatch will take it internal ( how a user reacts to a TV program, a stimulus, a news …. (that lists is endless)). Joining the dots internal and external and what a experience continuum you have created. Its really the next frontier of technology that Apple is blending with its horizons now. On retrospective- Was Windows8 dead on arrival? As Microsoft twiddled and twaddle Windows’ future of computing – Android has chugged ahead and going by the drop in PC shipments (the post PC era) and increase in the number of Android tablets and smartphones coupled with Windows8’s less than lukewarm acceptance – Microsoft has a problem. A big one. To complicate things, besides Windows 8.1, Cannonical (Ubuntu), Mozila (Firefox), Google (Android/Chrome) are also making bets in the shrinking PC/laptop space. Microsoft hasn’t really fired it in the tablet space – and is yet to find a toehold in 150 million/ $64 billion Tablet industry with the Surface! When Windows8 was being conceived it was seen as “more like a living organism, made partly from familiar bits that have evolved over the last two decades, with several new strands of DNA tossed in”. 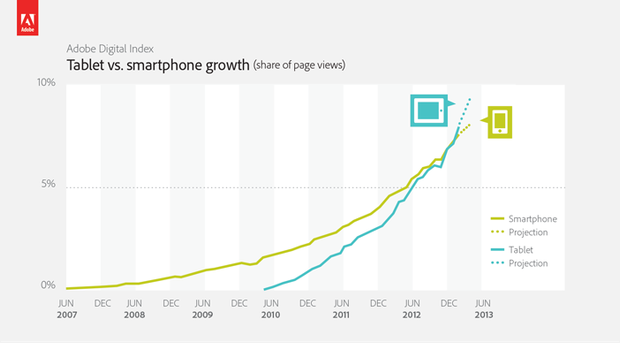 A better and a continuous experience on multiple devices was key to the rise and spread of Windows8. It was due to be updated for more often, and was a part of a much larger hardware-apps-services ecosystem that is also changing quickly.” However, if one were to refer to the numbers – Windows8 usage has been Windows Vista when compared month to month. 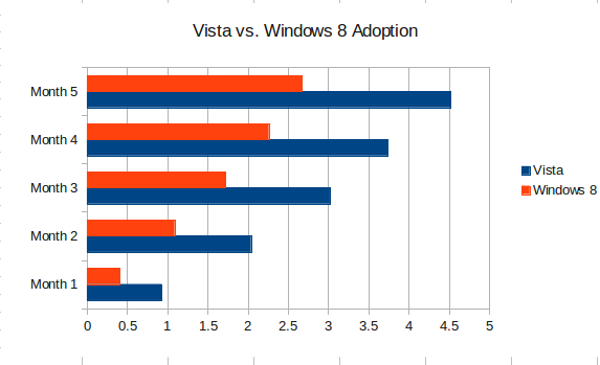 At similar points in their roll-outs, Vista had a desktop market share of 4.52% compared to Windows 8’s share of 2.67%. Underlining just how poorly Windows 8’s adoption has gone, Vista didn’t even have the advantage of holiday season sales to boost its numbers. Windows 8 usage can’t even keep up with Vista/s poor numbers. •	Thus, on a retrospective count, Windows8 Metro (refreshingly new as it were) failed to cut the ice – possibly because it was too abrupt a jump from the Windows7 Desktop UI to a “want to be a touch interface”. •	The interface was great for a tablet – but then again, Microsoft is way behind Android in terms of economies of scale – and the higher pricing served as significant entry barriers. •	Volumes not coming through, key OEMs such as Samsung dropped the RT platform. •	The $500-$1200 price tags on Windows8 made it uncompetitive in an economy that’s still not moving forward quickly. •	Microsoft also did not marry its traditional UI with the Metro UI successfully enough and the unfamiliarity was daunting. Windows 8, and its relatives Windows Phone 8 and RT, make no impression at all in the smartphone and tablet markets. All things put together, Microsoft doesnot seem to have moved any further with its Windows8. Microsoft is betting all its chips on the silly notion that Metro will be the one true interface for its entire PC and device line. But the numbers indicate that 8.0 hasnt really taken off. Alternatively it would have soured its relations with key OEMs who would see Microsoft’s ambitions in the device space as a threat to their own positions. Alternate OSs vieing for Microsoft’s 3rd spot in the OSs for the future is also seeing a lot of action and churn.Going back the Windows7 route is out of question – one only hopes that Microsoft is able to crack the business and user case with Windows 8.1. (Else it’s the doldrums. Microsoft yet to find a toehold in 150 million/ $64 billion Tablet industry with the Surface! 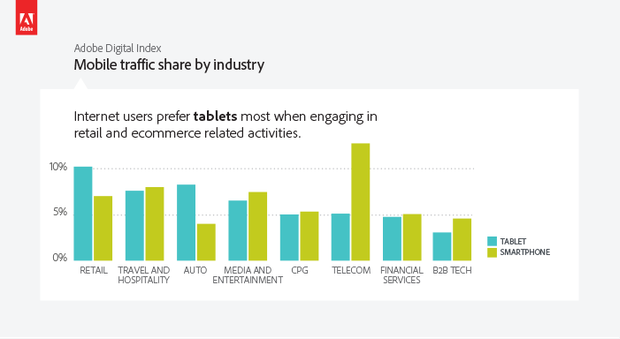 ABi research reports that the tablet market will grow this year by 38% to 150 million units. But the Microsofts and Blackberrys will contiunue missing the boat! With 3% of the current Tablet markets globally, Microsoft, Blackberry and other unidentified OS implementations don’t show signs of significant growth. The ABI Research report says that an estimated 150 million tablets will ship in 2013, worth an estimated $64 billion.The total number of tablets will grow by a projected 38% over 2012, and the total revenue will grow a projected 28%. Last year, according to ABI, 60% of tablet used iOS, 37% used Android, and the remaining 3% was made up of “others”. App publisher Animoca recently calculated the top 12 Android tablets, based on app usage, and it found that five of the top six are 7-inchers- and with iPad Mini touting the 7″+ form factor – Tablet markets in the foreseeable future could look to stabilize at 7″ form factor. Theoretically, that could bode well for Microsoft, because the company is said to be at work on a 7-inch Surface tablet. Surface tablets haven’t sold well, but perhaps a less-expensive and smaller form factor would help. A possible winner would be a 7-inch Windows tablet that takes advantage of Microsoft’s partnership with Barnes and Noble and taps into B&N’s vast book repository and growing video offerings, as well as into Microsoft’s successful Xbox-based gaming ecosystem. Still, if ABI Research numbers are right, Microsoft so far hasn’t been able to tap into people’s growing desire for tablets, and won’t in the foreseeable future.